Economist John A. List has been named the Visiting Robert F. Hartsook Chair in Fundraising at the Indiana University Lilly Family School of Philanthropy. A world leader in experimental economics, List will provide additional expertise that will expand the school’s ability to connect its activities with other groups of scholars and practitioners such as the Science of Philanthropy Initiative. List will serve as the visiting chair for three academic years, through June 2019. The Kenneth Griffin Distinguished Service Professor of Economics and Chairman of the Department of Economics at the University of Chicago, List is a pioneer in scientific methods used for testing economic theory directly in the marketplace. He has been heavily involved in conducting and promoting the use of field experiments throughout his career. "We are thrilled to have John List in this distinguished role at the school as we join forces to better understand philanthropy and implement measures that make a definitive difference," said Amir Pasic, Ph.D., the Eugene R. Tempel Dean of the school. "I know our faculty and students join me in congratulating and welcoming him." List directs the Science of Philanthropy Initiative, which seeks to connect academics with philanthropy in the marketplace. Under his guidance, the initiative investigates the motivations behind charitable giving and social preferences that shape it. The goal is to transfer that knowledge to practitioners and policymakers interested in philanthropy. List has twice been named to The NonProfit Times "Power & Influence Top 50" list of the most influential nonprofit sector leaders. In August 2015, the publication recognized him for "running field experiments to explore economic questions and behavioral principles for philanthropy. The process is very early but has the potential to be some of the sector’s most important academic work." "I am honored to join such a distinguished group of dedicated scholars and practitioners at the Lilly Family School of Philanthropy," List said. "This marriage will allow us to work jointly on some of the most important issues within the economics of philanthropy. I believe that through time field experiments will represent a key scientific tool for scientists and fundraisers who want to learn 'the whys' underlying key questions within the economics of charity. Why do people give? Why do they remain committed the cause? How can we leverage behavioral economics, social networks, and the like to fuel this most important sector of our economy?" As part of List’s contributions as visiting Hartsook Chair, he and the school will co-host the Science of Philanthropy annual conference alternately in Indianapolis and Chicago. He also will be a presenter in January 2017 at The Fund Raising School's Leadership Roundtable in Miami, Fla., which convenes experienced, nonprofit professionals to discuss innovations in charitable giving and donor behavior. "John List's leadership in applied fundraising research from his University of Chicago role has propelled him into worldwide recognition," said Robert F. Hartsook, J.D., Ed.D., Chairman and CEO of Hartsook Companies. 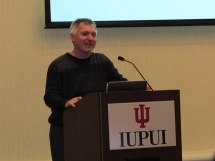 "For Indiana to attract this talented professor and his network has created high expectations for the impact of the Hartsook Chair and the school in growing philanthropy." To obtain data for his field experiments, List has made use of many different markets, including countless charitable fundraising activities. His work has provided insight on such issues as pricing behavior, the valuation of non-marketed goods and services, the economics of charitable giving, and the impact of incentives on education and weight loss. Prior to joining the faculty at the University of Chicago, List taught at the University of Central Florida, the University of Arizona and the University of Maryland. He was also a senior economist for the President's Council of Economic Advisers: Environmental and Resource Economics and Empirical Economics from 2002 to 2004. List currently serves as a research associate for the National Bureau of Economic Research (NBER), a position he has held since 2005, an IZA (Institute for the Study of Labor) Research fellow, a Resources for the Future (RFF) University fellow and an extramural fellow in the Department of Economics at Tilburg University in The Netherlands. The co-author of nearly 200 studies in peer-reviewed journals including Harvard Business Review and Oxford Review of Economic Policy, List is also author of several books, including The Why Axis: Hidden Motives and the Undiscovered Economics Behind Everyday Life, which has been lauded for its research-based findings in behavioral economics. He is editor of Management Science and Nonprofit and Voluntary Sector Quarterly, and associate editor of the Journal of Regional Science. He serves on editorial boards of several other journals. A highly sought-after speaker internationally on economics and philanthropic topics, List has received numerous honors, including the 2016 Klein Lecture Prize from the International Economic Review, a 2010 Kenneth Galbraith Award, the Arrow Prize for Senior Economists in 2008, and an honorary doctorate from Tilburg University in 2014. He was elected as a fellow by the American Academy of Arts and Sciences in 2011 and the Economic Society in 2015. List was a four-time winner of the Carl H. Galloway Award for Best Undergraduate Teacher in the Department of Economics at the University of Central Florida, where he held his first faculty position. He was named a Distinguished Alumnus of the University of Wyoming, where he earned his Ph.D. in economics in 1996, and the University of Wisconsin-Stevens Point, where he completed his bachelor's degree in economics in 1992. The Robert F. Hartsook Visiting Chair in Fundraising was created by and named for national fundraising executive Robert F. Hartsook, J.D., Ed.D., founder and chairman of the Hartsook Companies, Inc. Hartsook created the chair in 2006 as the nation’s first endowed chair in fundraising.